As building managers and those responsible for the protection of people and property, we seem to be constantly reminded of the dangers of active shooter incidents. Just last week, it was Orlando in the United States where a single armed gunman inflicted death and injury on more than 100 people. For the record, an active shooter is “an individual actively engaged in killing or attempting to kill people in a conﬁned and populated area; in most cases, active shooters use ﬁrearm[s] and there is no pattern or method to their selection of victims” (source). Active shooter incidents are almost a daily occurrence in the US. Orlando made headlines because of the record number of fatalities but they are incredibly common, just thankfully on a much smaller scale. From the research we have done, an active shooter cannot be categorised by one single profile. While they are mostly male, they come from all walks of life. The events are mostly pre-meditated and have undergone some level of planning. Anybody with even basic knowledge of guns, the means and intent could become an active shooter. Thankfully, the availability of high-powered weapons in Australia is limited which will deprive many people the means to enact such acts on our population. If we look at where these events are most likely to occur, the clue is in the earlier description of an active shooter – a confined and populated area. This can apply to many places: in Paris it was restaurants and a concert hall, Orlando a nightclub, Aurora Colorado was a movie theatre, Columbine was a high school, Queen Street was an office building, Nairobi Kenya, a shopping centre. These venues are common the world over and chances are we visit one or more of them almost every week. While it is not spoken about openly, our country’s biggest organisations have been quietly planning for these events for some time. They simply have to. We all have to. 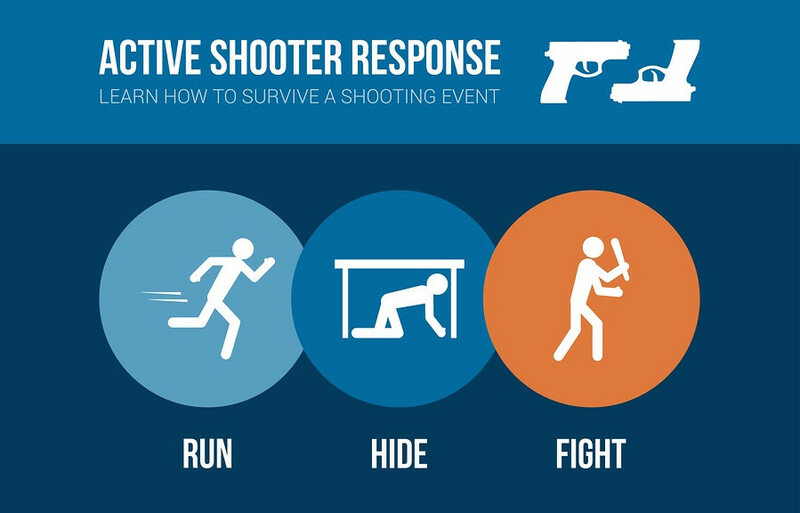 Regardless of how unlikely the events are of occurring, if your building or property attracts large numbers of people to it, you simply must have a plan to deal with active shooter incidents. In fact, I would go far as saying that it should be treated like any other emergency management plan the organisation may need. The mantra is to protect life at all costs so our policies and planning for these types and events need to reflect this. RUN: if people can get out, they should do so. HIDE: if people are unsure where the shooter is or don’t know how to get out, they should hide and where possible, barricade themselves in. FIGHT: if people get trapped and can’t get out, they should do whatever they can do to protect themselves and others. Whatever it takes. The policies and planning of property and security managers need to reflect not only this, but also how the business will manage the event, both during and post incident. What can security staff do? If your building has a permanent security presence, they by default become the first responders. They need to understand and appreciate this. They will have about 5 or 6 minutes before Police arrive so the responsibility on them will be enormous. Their job will be to not only minimise the loss of life, they need to deal with an unplanned evacuation while being the eyes and ears of Police. For buildings that have dedicated security offices, these areas need to be totally secure. People working within them need to know they are in a safe environment so they can do the job they need to do. Hopefully, the systems in place are appropriate and they perform as expected. Staff need to know the plan, just like they would any other emergency management plan. Primarily, they will need to know their role (if they have one) and where the exits are so they can direct people to safety. But honestly, there is a good chance they are going to be trying to get out just like everybody else. I thankfully haven’t experienced an active shooter incident first hand but have seen several post-incident. What cannot be appreciated is the noise which will be extraordinary. It alone will create confusion and panic and in all likelihood put enormous stress on even the best laid plans. Planning for events that are not even remotely likely to happen to us, may not seem like the best use of our time and resources. But that is what security and risk management is all about – understanding what could happen and then trying to minimise the damage if it should happen. We do it for fire and bomb threats and have done so for many years. It’s time active shooter policies are considered in the same light. Who in the organisation is going to be responsible for managing the incident? How will you be able to determine where the offender is? Will the decision be to lock-down or evacuate? What information needs to be available for this to be determined? How will it be communicated once decided? How will you alert people on the premises where the danger is? How will you be able to track the offender as they move through the premises? How will team members communicate with each other? How do you plan to keep the Police updated? Consider what information they are going to need. – Who – male or female, and how many? – What are they wearing and what do they look like? – What are they carrying? Police, even once on site, are still likely to need regular updates on the offender until such time as the situation has been resolved. Consider how this will be managed. While not specifically for building managers, here is a great reference document for individuals and could be used for staff training and awareness.